Our vision is excellence in client service. Our proposition to our clients is “Value Q.E.D.”. 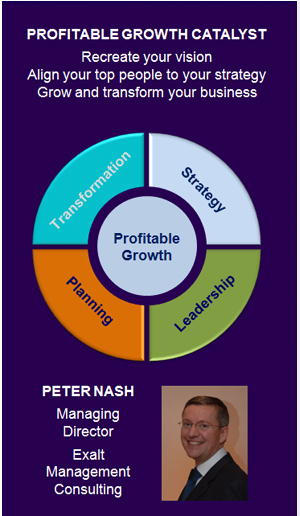 As we help our clients accelerate profitable growth, our own success and growth will follow. Our vision is excellence in client service. Our clients’ interests always come first. Exalt Management Consulting exists to promote the interests of our clients. Our clients’ interests always come first. Exalt means to promote and lift up; we exist to promote the interests of our clients. We work with our clients to accelerate profitable growth. Our clients win in the marketplace and gain advantage over competitors through clarity of thought and purpose, high team motivation, planning and making the right changes to their operating model. Delivery focus equal to a blue chip provider. A highly focused independent consultancy equal in skill and impact (but not size and price) to the established top strategic boutiques like BCG and McKinsey. Highly valued advisor to an list of high performing blue chip clients. Building and nurturing long term relationships with our clients. Famous for focusing on the most important strategic decisions and helping set the right course of action. Growing depth of expertise in our four focus areas, Strategy, Leadership, Planning, Operating Model Change. Consistent integrity of our Directors and Associates. “Do no evil. Avoid conflicts of interest.” This includes no active investing in client shares. We are sure that if we serve our clients well, our own success will follow. We have a total commitment to help our clients create a brighter future.